Architectural 3D visualization is the technology used by designing agencies, advertising, real estate, and construction, which aims to present digital and advanced architectural objects for every target audiences. It is used in print in different formats like billboards to flyers, television advertising available in formats like HD, Full HD, PAL, etc, as well as interactive presentations on both desktop computers, Tablet or PCs. Architectural visualization is widely used for various industrial projects at different levels by designing agencies. Cross Graphic Ideas is the best graphic designing agency located in Jaipur in the Indian state of Rajasthan. It is a full-service design 3D studio specialized in complete branding, 3D Visual and web design and digital transformation. We are dedicated to providing healthy customer experiences adapting to the various needs of clients. We create digital photo-realistic images and animations of the building which looks as if it has already been built. 3D Architectural Animation Services is a technology is the key to our design concept success. Our creative team provides 3D Architectural Walkthrough Animation Services that would really enhance your projects and also it helps to take the project to another level. By even showcasing our Architectural 3DAnimations, you are more likely to get more investors and financiers. We understand the importance of getting perfect animations for your business, which is why we have a strict quality check of designs. We know that 3D Architectural Animation Services is one of the greatest technologies to showcase the pictures from the imagination in real life images which creates the best world animated experience. The company has the goodwill of delivering High-Quality picture projects On-Time always. 3D INTERIORS WALKTHROUGH: This technology works efficiently using 3D Architectural Animation presentation which portrays different color hues, light intensity, and reflection and the play of shadows, reflecting interior or exterior lighting. 3D Architectural Walkthrough usually starts with a depiction of the external facade of the building where the structure, architecture and building materials can be shown. Exterior lighting takes natural lighting into account with variables such as window direction, seasons, diurnal variations and global latitude playing a role. Cross Graphic Ideas is specialized in 3D Walkthrough Animation Services like 3D Interior Walkthrough Animation, 3D ExteriorWalkthrough animation, 3D Architectural Animation Video, 3D Architectural Walkthrough Animation, 3D Floor Plan Walkthrough Animation, 3D Real Estate Walkthrough Animation, Residential 3D Walkthrough Animation, Commercial 3D Walkthrough Animation, along with 3D Walkthrough Animation Presentation , 3D Shopping Mall Walkthrough Animation, Hotel 3D Walkthrough Animation, and Restaurants 3D Walkthrough Animation. We attract people to your projects with our skills and talent and our work has always been well appreciated by our all clients. 3D Architectural Visualization companies are constantly increasing and are popular for showcasing their developments in the most eye-catching and user-friendly way possible. This technology is a great tool to attract them because your business deserves the best. A Sanctioned floor plan or design with the Sketch-up /PDF/CGI files along with existing site design if there is any. Existing top angle-site plans are preferred with photographs for peripheral details. Also, section/floor/layout/landscape/interior/level/design drawings are needed. Web programming is commonly known as web development. It is the development or programming of web applications on a website. These are the examples of some web applications which are social media/networking sites like Facebook, Twitter or e-commerce sites like Amazon. Everyone thinks that learning web development or design it is very hard. Well, it is not. It is done by programming and coding designed by professionals. Cross Graphic Ideas is a Jaipur based firm which designs all kinds of websites and 3D designs for your business. It is the best web-designing agency and 3D studio based in Jaipur. Cross Graphic Ideas has been doing this for 18 years. The Cross Graphic Ideas works with a great focus on creating innovation and developing unique ideas for website efficiency and visual appeal. Cross Graphic Ideas services include web development, Logo designing, graphic designs and 3D architectural rendering. 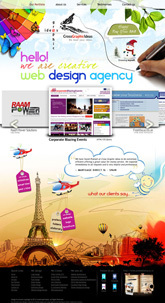 The team consists of skilled and talented designers with years of experience in web development. They are ready to meet any of your needs to turn your imagination into reality. Today, the internet has become a giant which contains over a billion websites which you can access through your devices. You need to brilliant, smart and fast to stand out from your competitors. Probably you may have a great product, but there are many options available in the market so you have to convince your client that you’re the best and with advanced knowledge of web designing experience. If your site still relies on outdated graphics then why a client should contact you? A web designer can take a mental picture of your imagination and should be able to turn your dreams into reality. In a website performance, SEO which is known as search engine optimization plays a great role in promoting the website or to attract traffic. If you already have a great website, but nobody is visiting it, then we’ll work with you to promote your website’s design and content in order to grab the attention of users and maximize your company’s ranking potential. Cross Graphic Ideas is the best Graphic designing agency in Jaipur which uses a combination of high-quality graphical design along with new-generation programming techniques to create a website with advanced and latest features, which are effective and looks beautiful. We create a series of web pages that are eye-catching and will surprise your clientele with their functionality and professional appearance. Our creative team knows the technique to load the content quickly. It helps us and our clients to enjoy the awesome experience possible. We follow the standard rules and recommendations from search engines and web regulators which are made every year. Since technology and trends are changing fast online, so we ensure to stay always up-to-date with more requirements and every project. Cross Graphic Ideas is dedicated to providing the best customer service in the city with unique ideas and full customer satisfaction. Our goal is to create excellence in our every project for our clients. Flyers are an excellent source to promote your business. It reaches the maximum audience and is very cost effective. The best flyer design agency in Jaipur is Cross Graphic Ideas. It is fact and we all know that flyers are a very effective promotional tool for your product or service which is largely accepted every time especially during offer or sale. Cross Graphic Ideas is a website designing agency and 3D studio based in Jaipur in the Indian state of Rajasthan. It creates stunning attention and eye-catching 3D graphics for the clients/companies of any size and any need. Cross Graphic Ideas is a full-service designing solutions provider that offers a variety of services related to any which can be designed, including graphic design, web design, web development, brand, identity development, search engine optimization along with 3D Architectural rendering and 3D Walkthrough. We may not be the big giant industry in the city but we surely are a clever one when it comes to creating smart and unique designs. Make Cross Graphic Ideas your first choice if you are looking for eye-catching flyer designing/poster designing or anything related to designing, copywriting, photography, printing and 3d Architectural. Cross Graphic Ideas provides 100% unique custom designs and services at reasonable prices. Each and every project we undertake is tailored specifically to your requirements even if it is a vibrant colorful eye-catching flyer designing/poster designing for a club event, or a stylish promotional flyer for your business. As our portfolio shows we are very adaptable and able to produce results that will exceed your expectations.We are dedicated to providing the best customer services in the city and that is why our customers return to us time and time again. Everyone knows that print and graphic designs are still the most accessible ways to let people explore your brand and remember the information you want to deliver. Nothing is more valuable than time and certainly, nothing is more valuable than a well-planned campaign as well which is revolving around an eye-catching logo, eye-catching flyer designing, eye-catching print ad or eye-catching brochure. Cross Graphic Ideas deals with all kinds of eye-catching printed brochures, eye-catching flyer designing, catalogs, leaflets, books, business stationery, eye-catching packaging, and exhibition stall stands which certainly always be a necessity for some organizations, and require as much design attention as their online counterparts. With years of experience in creative website design and development, Cross Graphic Ideas produced some outstanding and innovative work as highlighted in our portfolio. We focus on keeping things simple but with creativity and using modern strategy for effective and creative solutions. You can call us today to discuss your requirements for designing and you will get to know learn how Jaipur based graphic design agency could greatly enhance your company image. If you’re looking for a professional brochure designer, then your search is over. We are here for you and you’re in the right place. Cross Graphic Ideas is the one-stop-shop for all your solution related to anything to designing. We deal with brochures designing, Logos designing, Business Cards, Banners, Flyers, Pocket Folders, Print Marketing and many more. Our agency is more than just brochure design. The creative team has worked together for more than 18 years producing a variety of amazing and unique designs influencing all the designing industries with its talent clients from all over the world. Cross Graphic Ideas is capable of producing brochures with an amazing custom graphic design for all your print marketing requirements, eye-catching business card design, unique logo design, web-designing along with printing for companies and famous organizations across the world. The team is specialized in brochure design, print marketing, website design, corporate branding and 3D architectural designing with over 18 years of experience in business marketing. If you need a corporate brochure, logo design, tri-fold brochure, sales collateral, training manual, booklet, presentation folder or a catalog, Cross Graphic Ideas is your destination because we have the expertise to deliver on time and at a price that works for all small business. Our team is dedicated to providing all projects on time with satisfactory customer service. You can simultaneously work with our designing team to portray your ideas and we are skilled with handling any size project. We have a creative team trained in special areas of designing professional ready to get to work to make your print marketing look outstanding! Every comment and markup you make on your proof we see in real time. You can attach files, tell us changes needed, ask a question or give us praise—sure, don’t be shy. More importantly, we are more than simple order takers. We offer professional feedback and advice. We collaborate until your design becomes the best it can possibly be. We deliver your project using advanced technology. We take care of the design, and if you’re not satisfied then we keep on working until you’re 100% satisfied. Cross graphic ideas is the famous brochure designing company based in Jaipur which is purely dedicated to designing and client’s satisfaction. People at this firm are specialized to give a unique touch in every design they create. People start planning when they are about to launch a new project. There planning takes a lot of time and before the actual works begin, the need a blueprint of that particular project. Similarly, a designer helps you to get a 3D model of the building before the actual work starts so that if you have to make any changes you will able to do it. When a manufacturer launches his product in the market, he knows the requirement of the consumers and uses some strategies to make his product work in the market. Likewise, when an architect constructs a building, before starting the actual construction process, a model or a graphical representation is prepared like 3D Architectural Visualization which helps to get an idea of the project and an accurate vision of the building. The constructing a building is a big deal and very expensive so it is better to have these options because one just cannot risk everything. So, a graphical representation like 3d Architectural Visualization helps if you want to change something when the design or plan changes according to time or technology. The 3D Architectural Visualization is a technology used by many builders and architects, along with real estate industries, interior designers and designing agency like Cross Graphic Ideas. We all know that graphical representations are always more helpful than words for a clear understanding. It is all about creating an image from imagination to bring into reality. Today, 3d Architectural Visualization is the fastest growing technology in the industries and is used by every other designing agency with specialized skills. The term is widely used in designing industries and is commonly known as 3D graphics Visualization, 3D rendering, computer-generated imagery (CGI), and other forms of 3d Visualization. However, it is not the same as 3d designs; it is much more than that. Architectural Animation Walkthrough is a technology to breathe any art or imagination into the design. 3D Rendering is the most important and used technique by every industry to make your Imagination in real life movement. 3D Walkthrough is an outstanding technology when it comes to your 3D modeling Imagination to be seen in live from the paper before the final project or the task takes place. Currently, in this animation equipped world, photo realistic rendering is the most important technique which is used worldwide to make your actual dream come true. According to the researchers, 3D architectural animation service is the key to your design concepts. The creative team of Cross Graphic Ideas provides 3D Architectural Walkthrough Animation Services that really enhance your designing skills and projects to take it to another level. When you showcase Architectural 3D Animations, you are more likely to achieve more investors and financiers better than before. The firm has to understand the importance of getting perfect animations, which is why Cross Graphic ideas have strict quality checks. It has been proved that 3D Architectural animation services are among the greatest technologies to showcase your designing talent and creativity and portray imagination into real life images out of models and arrange them in motion to create out of the world best-animated experience. Cross Graphic ideas have a reputation of always delivering High-Quality content On-Time. Anyone who is managing a website would definitely come across this one. They know what SEO and SMO actually are. They constantly look for ways to keep promoting the content which is there on the website in order to increase the traffic of the website. SMO is defined as Social Media Optimization, a very important factor to be learned when you are managing a website or social media platforms. It is basically an important tool in your internet search rankings. The company’s strategy is also based on this tool as it helps to increase the position of your website on Google search rankings. It is a process of enhancing/increasing the awareness of a product, or in other words, you can say that the visibility of your product in a global platform so that it can reach to as many users as it can to help the brand or event through various social media platforms. SMO (Social media optimization) works according to a strategy that you plan. It includes RSS feeds, social media sites with videos, along with social news, bookmarking sites, and blogging sites. SEO is another important factor which is quite similar to SMO. Google has defined SEO as search engine optimization to attract traffic from worldwide to your website. In simple words, SEO and SMO help you to promote your stories, web-content and drive traffic to your websites when you work on Google search. Using optimization, there are various direct and indirect benefits. Now, the direct benefit can be simply defined as people searching your profile/product and connecting with you by visiting your website. However, the indirect benefit is defined from an additional link which you provide pointing to your website within your profile. Following are some tips to enhance your knowledge about SMO. The links available on social media platforms are often considered as higher-quality as the sites have a high web authority. The website or profile page that you create often seems like a simple task. However, have you ever thought that is your product reaching to your customers or target audience? Selection of keywords is very important for the website, blog, content, and ad campaigns, because keywords are searched according to the requirements in your stories and also which are trending on Google. This helps to keep your content/story or description of your product or service relevant to your target audience. There is a reason that the word ‘Social’ comes in ‘Social Media’. People gathering in social media platform are in huge numbers. Keywords or SEO helps to track your stories by the people who searching or looking for the same thing. Like SEO, Social media optimization (SMO) also plays a major role in the performance of a Website. Tools like Social Media Marketing and Optimization for your blog or Website has really become equally important for the brand. It matters the most for an E-commerce site, Social Media Optimization is very important, because nowadays, people use social media or recommendation more for buying products online. Moreover, working on Social media platforms will help you to explore more and create a brand of your own. It is a strategy to use SMO or a technique to promote your products and service to build a brand on various social platforms. That includes social media sites like YouTube for videos, Facebook and Twitter for social networking, Stumble Upon, Reddit for social bookmarking and many more. Using search engine optimization which is commonly known as SEO is that you are targeting traffic from search engines that include on page and off page optimization and social media optimization (SMO) is used mostly for page optimization and promotion. Visitors from different social media websites are the people who are in a rush to search for news and stuff and remember that they are not going to stay for long. Now, if you want them to stay and lower down your bounce rate then you to give them a reason and keep them moving around within the website using related articles or links associated to your own website. When you organize an event, you make everything look perfect and it has to be because the more your event looks fabulous, the more you hear good things about it. There are many stalls which operate their business during the event. There are many custom Exhibition stalls designs are installed portable displays for the Events. CrossGraphicIdeas is specialized in stall designing for any exhibition or event. People organize events from time to time and f you have an exhibition coming then CrossGraphicIdeas can help you to create plans and strategy according to your concepts with our creative exhibition stall designers. Our execution team provides smooth services to build an exhibition stall without any hassles. The creative team helps to add value to enhance your imagination/ideas for Exhibitions, Events, and Conferences. CrossGraphicIdeas create 3D concepts to transform three-dimensional spaces to bring the brands to real life. CrossGraphicIdeas use creative design skills to help enhance your brand image strategically as per your requirements. Our creative team focuses on designing displays, stands, and panels which are used at exhibitions, conferences and other events. Our creative designers are dedicated and are always prepared to make sure that your exhibition booth stands out in a unique way among your competitors. Our creative team works with you to enhance your plan and design. If we talk about “Stall Fabricators”, it is a fabrication agency which is specialized in designing stalls so that the brands or the companies can showcase their products and services in a unique and meaningful manner. CrossGraphicIdeas ensure to enhance your presentation idea by providing a quality impact for your brand. The creative team is dedicated to working with you in functional areas to understand the strategy of your presentation. Our plan includes converting the dreams of the customers into reality by offering them a good service because what we believe is that our customer satisfaction is our primary and the only target. Jaipur based Stone mart is a professional natural stone manufacturer and supplier which carries years of experience in their respective profession. However, a stone is described as a natural solid form of one or many minerals. It has been found that there are thousands of types of stones available on the earth. Researchers say that a variety of natural stone comes from countries like the United States, Mexico, Italy, Spain, Turkey, China, Taiwan, India, Greece, Canada, France, and Brazil. Stall design or stall creation are used in exhibitions which offer a path to the companies/brands that help them showcase their products and services to their target audience. Being a leader in the designing industry, CrossGraphicIdeas ensure to offer great exhibition stands which stand distinguishable. CrossGraphicIdeas is dedicated to helping in developing 3D exhibition stall design concepts to deliver an outstanding service to your brand. The 3D creative images and themes help in fulfilling the brand/client’s need along with their objectives and our 3D designed exhibition stalls give you a prior image so that you can know how your stall will look during the show. CrossGraphicIdeas is constantly flourishing on innovation and improvisation to enhance the idea of your imagination and the team is always ready to serve you any kind of designing service.